What Do You Do When The Receptionist Cannot Transfer You Without A Contact Name? 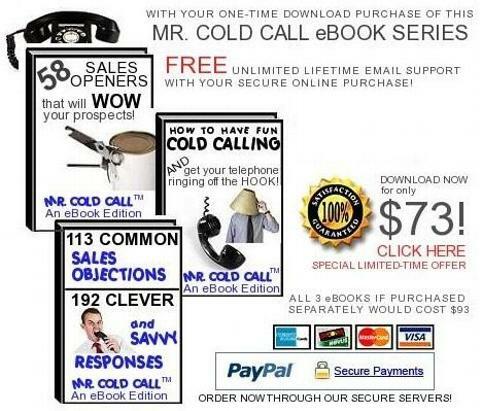 Successful cold calls always begin when you know the name of your sales prospect before you intend to contact them. What do you do when you don't have the correct contact name of your sales prospect? Your first response is to ask the receptionist, no? Though, if you ask the receptionist for a name then that instantly spells out "I'm a salesperson" to them and they will not give you the information. So in many cases, you will hear them say, "If you have no name we cannot transfer your call." Has this ever happened to you? Many company's have a section on their website that profiles their management team. This section may be located under the "About Us" button or under a section called "Management Profiles." These sections usually include a short biography of the sales prospect that you may be looking to contact. If you are successful in locating your sales prospect this way then try to find something in their biography that you can bring to your sales call in an effort to warm up the call. If you are unable to locate the correct name of your prospect from the management team profile or if they are not listed then at least you have a few names that you can use when speaking with the receptionist. Once you have a contact name of an executive you can now ask for that executive. You will most likely be transferred to the receptionist of this executive and now you can ask for the correct name of your sales prospect. You can find the technical contact of your prospect’s company website if you visit any domain registration website such as www.godaddy.com. Once you visit the domain registration website, you can type in the url of your prospect's company to locate the technical contact, their email address and phone number. All you need to do now is contact this person and tell them that you are trying to locate who is in charge of (Say the title of your desired prospect). As a side note, you will also see the technical contact’s email address and if you do get a contact name you now have a prototype of how the company email addresses are structured. For example, if you see that the technical contact's email is listed as the first letter of their first name followed by their last name then you can apply this structure to your contact’s name and then email them! If you have the title of your prospect and need to find their contact name then use Google. Try using quotes around your search requests. For example, type in “Title of your prospect” and “Name of your prospect’s company.” Also, besides hitting the search button on Google there is also a News link just right above the search box that you can also click on to see if there are any recent news stories that include information to help you in your name search. Many companies use news distribution services such as www.prnewswire.com to distribute company press releases. If you visit these sites they allow you to do advanced searches for companies who have used their services. You can use PR Newswire to locate the name of your sales prospect by typing in the title of your prospect and their company. One option that you have to locate the name of your sales prospect is to just keep dialing different phone numbers and wait for someone to answer. Once you have the company’s main phone number it’s easy to just change around the last four digits till you reach someone and just tell them that you’ve reached the wrong extension. Then you can politely ask them for the correct name of the person in charge of (List department name). If you happen to be contacting a public company then visit Yahoo Finance and type in the ticker symbol of your prospect's company. Once you have brought up the company’s stock quote you will see a text link on the left called "Profile." In this screen, you will see a description of the company and a listing of all the key executives at the company. And finally, the other text link that you can click on to locate this information is called "Insider Roster."